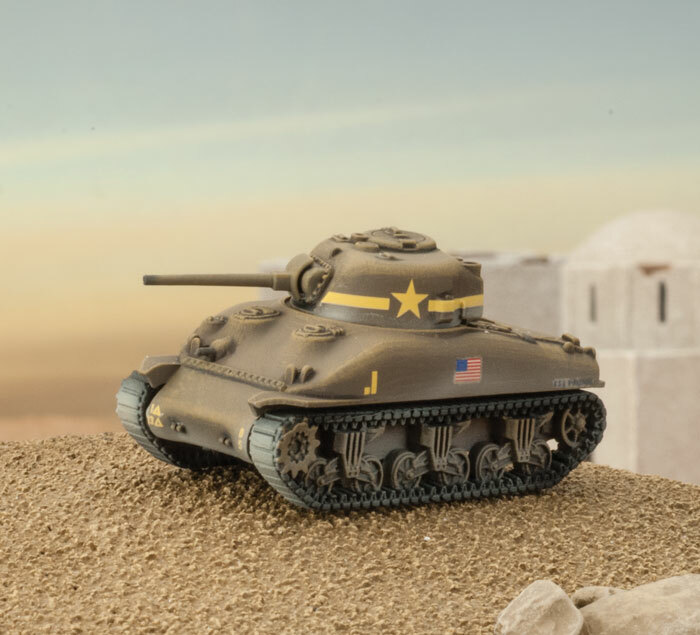 This week we take a closer look at the first wave of the American desert TANK releases, the Sherman (Early) and the Stuart. Both packs are adding cheap tank options to American platoons, as well as adding some cool new upgrades to the game. American platoons have never had access to a Fast tank until now. The Stuart is a small reliable tank that is fast and also has the new Cavalry rule. This new rule gives the Stuart an extra Defense while within close range of an enemy tank. This bonus applies to any tank shooting at the Stuart and encourages an aggressive play-style for Stuart focused platoons. 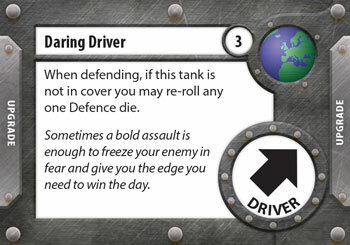 The Daring Driver upgrade is awesome on the Stuart rewarding players for being bold and driving directly into danger! Gaining +1 Defense with Cavalry and being able to re-roll a Defense dice each time the Stuart is shot while in the open. This will help keep the Stuart in fighting shape. The US Sherman has evolved during the war, so far players have had access to the two late war Sherman tanks, the Sherman (75mm) and the Sherman (76mm). The late war versions have a bit more Damage Capacity and Initiative, so they end up costing a bit more. In the Desert the early US Sherman tank has not had all the enhancements the late war variant have. So they are a lot cheaper point wise being a whole five point cheaper then the Sherman (75mm). 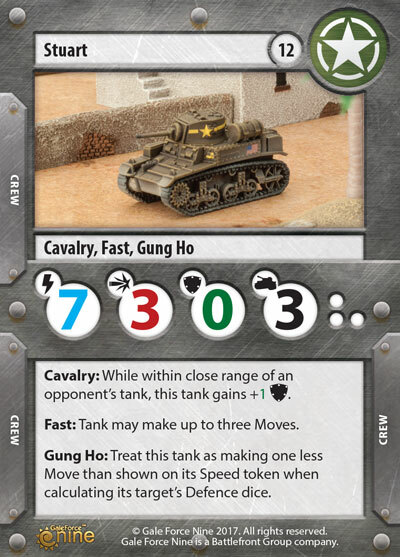 The Sherman Platoon upgrade is an interesting card, as it’s the first Dual Nation card in the game. British players need not worry as the card will show up in a future British release, but for now it can be obtained in the Sherman (Early) expansion. The card works with every Sherman variant in the game including the Firefly. We wanted this card to reward players for building a Sherman focused platoons. The Initiative the upgrade gives you increases the more tanks you have in the list with the upgrade, so in a list with five Sherman (Early) tanks with this upgrade would give a +4 Initiative to each tank! This bonus does go down each time a tank with the upgrade is destroyed. These two tanks will add some interesting choices to American platoon. 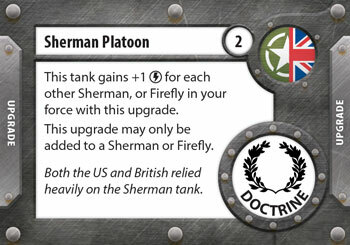 The Sherman expansion comes with the Sherman platoon Doctrine upgrade card. A card that will really change up your already existing Sherman platoons as well as adding another cheaper Sherman to field with your mixed Sherman platoons. 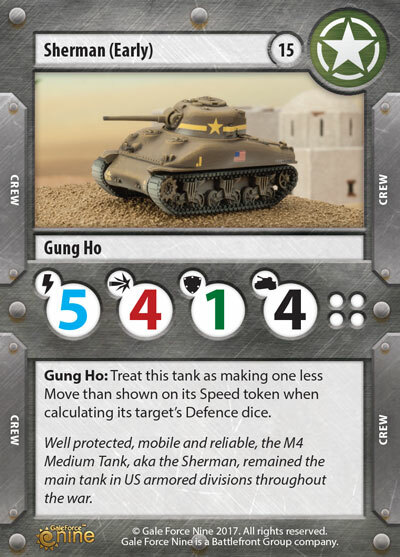 The Stuart adds speed to the American platoons, Gung Ho and Fast is a powerful combo, as you give out one less Defense dice, this will help make up for your low Attack of three. Imagine adding Daring Driver and Bloodthirsty Gunner to a whole platoon of Stuarts.